Ukrayinska Pravda (Ukrainian: Українська правда, literally Ukrainian Truth) is a popular Ukrainian online newspaper founded by Georgiy R. Gongadze on 16 April 2000 (the day of the Ukrainian constitutional referendum). Published mainly in Ukrainian with selected articles published in or translated to Russian and English, the newspaper is tailored for a general readership with emphasis on the hot issues of the politics of Ukraine. The Ukrainian government has at times reportedly exerted pressure on the publication to restrict access to information. Along with Hromadske TV and Center UA (Center for United Action), Ukrayinska Pravda is part of the Kyiv MediaHub. 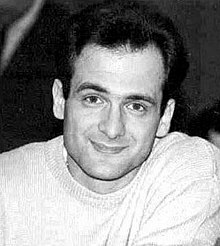 Georgiy Gongadze, co-founder and first editor of the Ukrayinska Pravda. Ukrayinska Pravda's chief investigative journalists, Serhiy Leshchenko (center) and Mustafa Nayem (right), interview politician Taras Chornovil. Ukrayinska Pravda's journalist Pavel Sheremet died in Kiev on 20 July 2016 in a car explosion. The newspaper was often first to investigate and publish the material on corruption or unethical conduct of, or related to, Ukrainian politicians from all political camps. In December 2002, Ukrayinska Pravda was refused a press accreditation by the (then) General Prosecutor of Ukraine Svyatoslav Piskun (an offence against the Criminal Code of Ukraine). Staff and contributors of the Ukrayinska Pravda have pioneered many legal and research techniques aimed at advancing freedom of information in Ukraine, particularly those concerning the public spending, public procurement and offshore tax evasion. Staff journalists routinely participate in non-partisan public actions promoting democracy and press freedom in the country. Editorial copyright disclaimers collectively describe these sites as the "Ukrayinska Pravda Internet Holding", not specifying the legal nature of the holding. Among regular bloggers at Ukrayinska Pravda are Anatoliy Hrytsenko, Ruslana Lyzhychko, Inna Bohoslovska, Tetyana Chornovol, Yuriy Lutsenko and many others. ^ "Pravda.com.ua Site Info". Alexa Internet. Retrieved 2014-04-01. ^ "Українська Гельсінська спілка з прав людини". helsinki.org.ua. ^ Kramer, Andrew E. (20 July 2016). "Pavel Sheremet, Journalist in Ukraine, Is Killed in Car Bombing". nytimes.com. The New York Times. Retrieved 20 July 2016. Wikimedia Commons has media related to Ukrayinska Pravda. This page was last edited on 15 January 2019, at 07:24 (UTC).